collection, or transportation of containers. ●Compost agitation and loading, snow removal, field leveling, and digging. 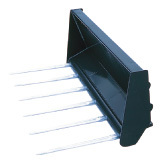 ●Used for as a fork bucket or forkless bucket by attaching or detaching the blade. ●Collection and transportation of earth and sand, mud, snow, and others in bulk or snow removal. ●Ensures an increase in digging performance with forks provided to the bucket. ●Collection and transportation of excrement, chaff, and sawdust, or snow removal. ●Digging, field leveling, and transportation of heavy loads or snow removal. ●Collection and transportation of pasture grass. ●Transportation of vegetable containers and boxes. ●Ideal for earth and sand removal and shifting, snow removal and shifting, and reclamation. ●Flexible angle adjustments are possible manually or hydraulically.